Unity. ‘The state of being united or joined as a whole.’ ‘The quality or state of not being multiple.’ ‘A condition of harmony.’ These are some of the definitions of the word ‘unity’ one finds with a quick search of reputable online dictionaries like the Merriam-Webster. Where Ontario-based Unity Audio’s Inner Soul loudspeaker is concerned, these words are appropriate indeed. To my ears, Unity Audio’s single driver Inner Soul speaks in one detailed, vivid, crystal clear voice. Shout, nasal whine, sibilance…these are the things we can do without. The Inner Soul has relegated single driver ‘shout’ to the dustbin of history. Unity’s owner and designer Omer Humayun is no stranger to the danger of single driver speakers. During the early 2000s he made several Unity Audio speakers built around hard-to-tame Fostex drivers. The payoff came quickly in the wake of rave reviews but soon Omer’s cabinet makers folded their operations. Omer had never quit his day job so he could afford to put Unity Audio’s speaker division on hold even as he continued to make his giant-killer cables and cords. The rebirth of Unity’s loudspeakers in 2014-2015 is cause for celebration. Unity is, as its name suggests, all about coherence. These speakers create a gigantic wall of sound even as they disappear in your room. Detail retrieval (metal strings scraping on AC/DC’s “Ride On”, the resonant oud of Anouar Brahem) is exceptional. The Inner Soul will find all the ambient cues captured in the recording studio, putting me right in the echoing room with Shelby Lynne. The Inner Soul can retrieve the subtle inflections of Bon Scott’s voice on his romantic ballad “Love at First Feel.” The Inner Soul is crisp and clean. There’s no smearing, no congestion. Cymbals and brushes are rendered with 20/20 vision without screeching. For PRaT demons and detail retrieval freaks who shudder at the thought of Lowther or Fostex shout, here is your speaker. The Inner Soul is a polar opposite to my beloved Harbeth Compact 7 ES-3 with its dark, warm, relatively slow sonic signature. The Inner Soul is fast, fast fast. It does not get congested when faced with complex music such as Bela Fleck’s bluegrass ensemble consisting of banjo, guitar, double bass, mandolin, violin and dobro. There are no nasty high frequency peaks to the Inner Soul, and in the valley below there is a surprising amount of dry, detailed, rapid-fire bass with no obvious sudden roll off. True, these speakers are not for metal heads. Bass images are firm but relatively small. But in a small room, with a jazz trio recording, I don’t itch for a subwoofer. On Ray Brown’s “Soular Energy” I was shocked at how well these standmounts did. The Inner Soul’s bass is firm fast and consistent with no obvious woolliness or break-up when it has reached its limits. The Inner Soul has no obvious flaws, just one predictable limitation inherent in a single 4 inch driver: you cannot expect this speaker to convey the scale and thunder of orchestral music in an entirely satisfactory manner. But with less demanding chamber music and even some rock music, including Rush and AC/DC, I was thoroughly satisfied and frankly surprised at how large the Inner Soul sounded. On Gordon Lightfoot’s “The Soul is the Rock” the Inner Soul does a fine job of separating the numerous instruments and dubs in this over-produced coulda-been-a-classic-with-better-production-of-a-song. Crossover-less single driver speakers like the Inner Soul are the very antithesis of over-engineered multi-driver aluminum boxes. Behind the simplicity of parts lurks a complexity of design, only it’s hidden, on the inside. Bracing, porting and damping become crucially important. Like any thoroughbred, single drivers are hard to handle. In expert hands, however, they can leave conventional two-ways in the dust. Especially where vocals and acoustic music are concerned. On Coltrane’s rendition of “Soul Eyes” the tenor sax is eerily present in my room. As with vocals, a good single-driver should create a sense of utter realism where brass and woodwinds are concerned. The Inner Soul is true to form, capturing the reediness and breathiness of Coltrane’s sax. Trumpet can be a bit searing with a single-driver. That was the case with Miles Davis recordings using his Harman mute. But there are no searing highs on Freddie Hubbard’s “Soul Surge,” the opening track to his 1966 LP “Blue Spirits.” This LP provides a great way to showcase the strengths of the Inner Soul: from the fast congas to the fluttering flute to the tenor sax I sat in a trance as I imagined a concert before my eyes and ears. This is what small stand mounts do better than any other loudspeaker type in a small room–they simply disappear and lay before you a realistic soundstage. Looking deeper into the Inner Soul, we’ll find Unity’s own “Solid Link” series wiring. The cabinet is Canadian-made MDF with a vinyl or arborite finish. Porting is at the rear. I did not place my review copy close to the walls so I cannot comment on how these speakers will perform, on, say, a bookshelf. Not that you would want to do that; the Souls are open and airy and they really belong on some good stands like those made by Skylan. At just 91 dB, the Inner Soul’s sensitivity is above average but a bit on the low side for a single driver. Nevertheless, with its easy 8 Ohm impedance I had no trouble driving the Soul with single ended amps by Elekit and Musical Paradise putting out 6 to 8 watts. To be sure, the Soul really wanted to see the 22 watts of my Line Magnetic amp–here was a perfect pairing as the LM imparted warmth and roundness to offset the Soul’s sometimes sharp edges. This leads me to a second caveat: these speakers are neutral and highly revealing of poorly recorded fare. Those with large collections of bright 1970s rock compressed onto poorly mastered 1980s CDs should probably look elsewhere. Those with large collections of Chandos or Harmonia Mundi chamber music recordings–here is your speaker. The Soul’s single driver is a new wooden model made by Solen and modified by Unity. It goes down to 48 Hz, which is just shy of my Harbeth Compact 7s’ 46 Hz. Each Inner Soul weighs approximately 15 pounds and is 8 inches wide, 12 inches deep and 14 inches high. The Inner Soul comes with a 10 year warranty. 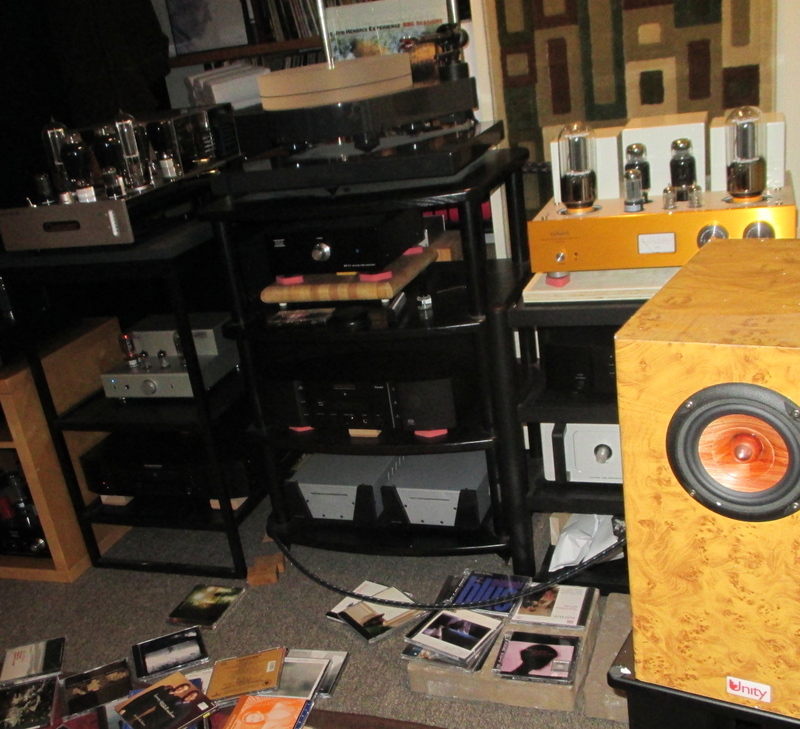 At one-quarter the price of my Harbeth Compact 7s, the Inner Soul is three-quarters as good. My review pair was an early production version, one step up from prototype in fit and finish. Originally it was to retail at $650 but Omer decided that a better finish was necessary, so the price has gone up to $699 CAD. You can see the fit and finish options at the Unity Audio website. Even at the entry level price of $699, I consider these speakers to be something of a bargain. 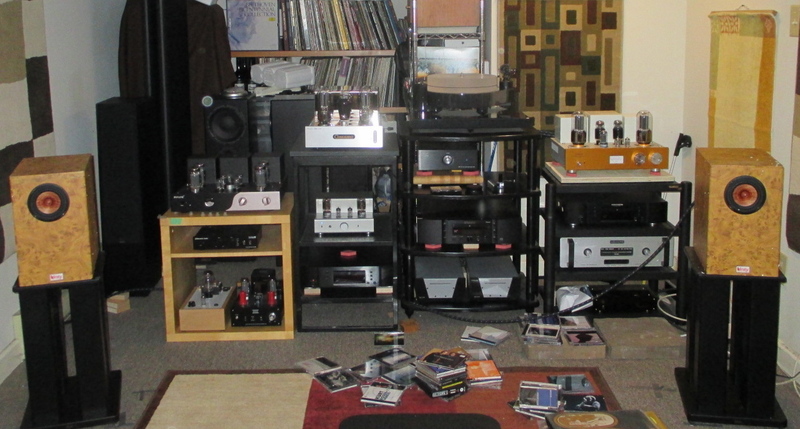 If you listen to your music in a small or medium-sized room, and if you’re intent on building a system for under $5,000, you probably don’t need more than the Inner Soul. The Soul paired very well with amplifiers and sources worth two to five times its price. To wrap up, the Soul is all about purity, clarity, speed and inner detail. In a small room with music played loudly, imaging will sometimes rival planar speakers. Bass is surprisingly adequate given the obvious limitations of a 4 inch driver. What’s not to love about the Unity Audio “Inner Soul”? 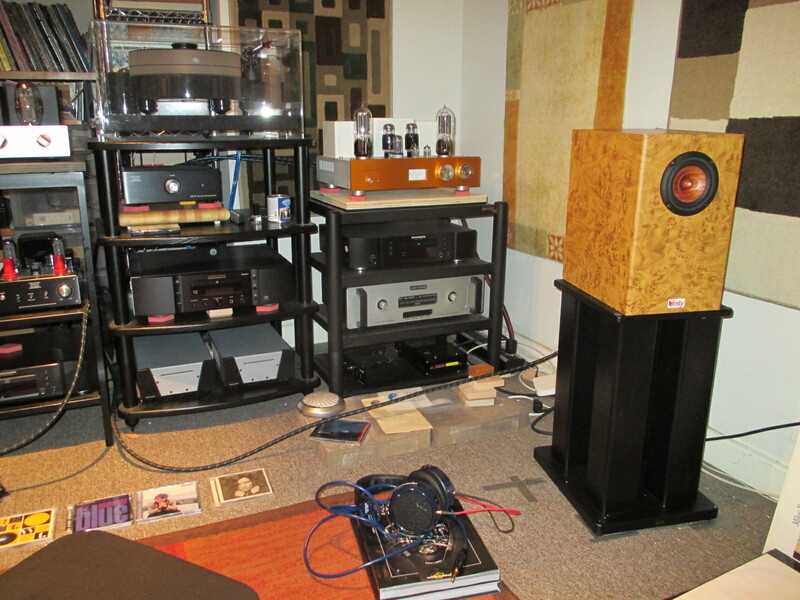 The Inner Soul sounded just fine on stands made by Skylan for the Harbeth Compact 7. Smaller stands made for Harbeth’s smallest speaker did not fare so well. The stand legs shown above and below are filled 3/4s with sand. This provides a solid foundation and allows for deeper bass. The Soul is the perfect solution for those with small rooms seeking a sensitive speaker to mate with a single ended tube amp. At $699 to $950 CAD there is competition from Asia from established brands like Epos, Castle and Mordaunt Short, to name just three. In North America, the Tekton Design M-Lore will cost you at least $950 to $1,000 CAD when the exchange rate, shipping, taxes and customs are factored in. The M-Lore is an entirely different beast in both its construction and its sonic signature. Omega Speaker Systems from Connecticut is probably the closest competition, but Omega provides a different flavour using its in-house drivers and alnico magnets, and with the Canadian dollar trading at just 0.80 USD and with the euro having dropped in value too Omega is no longer the bargain it was just two years ago for those not paid with the greenback. Unity Audio from Canada is providing audiophiles with a unique product at a reasonable price. Highly recommended, especially for lovers of vocals, piano sonatas, woodwinds and acoustic guitar. Jazz trio and chamber music devotees with small rooms should audition this fine speaker. Hi Dave – if you contact Omer (Unity Audio), he can advise on where you can hear them.